BY WAY of an editorial disclaimer, can I assert that the following comments bear no reference to the current legal woes of three Batley men found allegedly trying to take £900,000 through the Channel Tunnel. The matter is sub-judice and the law will have its day, but I write with wonder as someone with years of experience of the border-crossing collywobbles. My first trip abroad, aged 22, ended with me riding a ramshackle bus from Athens to London in mid-winter. There were Afghans, Greeks, Serbs and all sorts on board, including a young hippy white kid with dreadlocks. He must have endured half a dozen body searches at the various borders, bless him. He probably still has trouble riding a bike. I recall that US customs in particular used to be a nightmare and I got searched once having misguidedly written “nothing to declare” regarding bringing gifts into the country. Another time I was in a mad rush to get across Heathrow Airport to make a connecting flight. Big mistake – rushing through an airport. Guarantee of a stop and search and a missed plane. “It’s a week’s worth of ripe y-fronts, three sweaty t-shirts and a toilet bag you jobsworth dipstick,” (I thought, but didn’t say). He knew that – he just wanted to make me miss my flight. They can barely contain their joy at inconveniencing an obviously flustered member of the public. 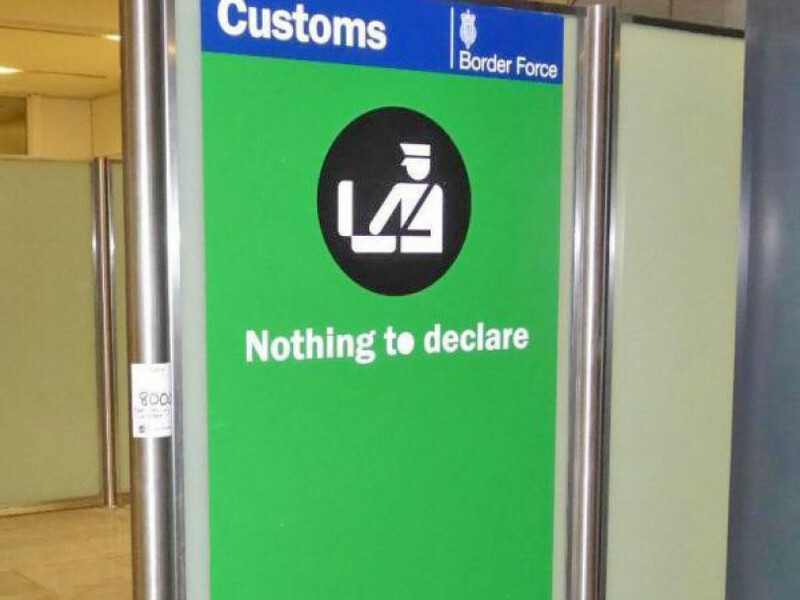 But come on, admit it – who amongst us hasn’t walked through the ‘Nothing to Declare’ doorway feeling just a little nervous over whether the spirits allowance is one or two litres of gin? And yes, I’m sure you’ve done it, as you walked past those opaque sheets of glass, the one-way windows beyond which peer the beady eyes of customs officers – admit it, you’ve adopted an overly casual, ‘I’ve got nothing to hide!’ saunter, haven’t you? Or maybe you’ve even guiltily perspired a little? Even when you’ve had nothing more embarrassing in your suitcase than a pack of condoms and a mankini? Last spring I was taking the Hull ferry to Rotterdam and found myself in a shed with half a dozen officers basically taking my motor apart. I know I can be dangerous with my Ping 3-wood, but usually only to fellow golfers. (I’ve since deduced that was probably the first instance of my being on an official ‘target’ list). But given last week’s news about the charges being brought against three Batley gents (see page three), what I really can’t imagine, is girding my loins to drive the thick end of a million quid in cash onto the Eurotunnel. To reiterate, the chaps may well have been oblivious to their cargo. Time will tell. But can you imagine the conversation with a wide-eyed customs officer who found that stash in the back of your old banger? “It’s just some dirty gear, officer, we’re taking it for laundering...” (quite possibly a true explanation, you’d have to say). “Ah yes, this load is paper – we’re taking it for recycling…” (again, works for me). I dare say the three Batley gentlemen arrested and charged with money laundering at Folkestone have an eminently plausible explanation for the discovery, and I look forward with relish to hearing it in court. EFFECTIVE this week, your full super-duper digital edition of The Press will regularly be freely available in glorious technicolour, either on a Thursday night or first thing on a Friday morning. Whether on your PC, laptop, tablet or phone, you can access the full page-turning edition and even download the entire darn thing. I know, we’re virtually cutting off our nose to spite our face, but these days the customer is king. So whether you’re a loyal supporter who shells out 50p, someone who gets The Press through your letterbox, picks a free copy up, or now reads online, we just want to keep spreading the message. In the week that our poor, downtrodden old pals at the Reporter, Batley News and Spen Guardian were again offering to put free adverts in the Morpeth Herald (it’s up near Scotland I think) we just want to keep building our local readership. Access the edition from Facebook (ThePressNews) or Twitter (@PressNews Latest) – and be sure to like, follow and share! I DON’T tune in for the puerile banter between Jeremy Clarkson and his two driving pals on their Grand Tour motoring adventures. If you enjoy the bloke-ish mickey-taking, good for you. One person who certainly doesn’t is Will Young, the lightweight songster of Pop Idol fame. Young is currently trying to get Amazon Prime dragged before a judge for hate crimes, courtesy of Clarkson telling Richard Hammond he drives like a big girl’s blouse, or words to that effect. Will Young is accusing Clarkson/Prime of driving fragile young LGBT persons to the brink of suicide with their mildly insulting exchanges. We all know the world has gone mad anyway, but clearly Young has far too much time and money on its hands (you can’t use a he/she pronoun – hate crime!) than is good for it. But please, Will darling – if your highly strung LGBT friends are so offended by blokeish banter then, like me, they really don’t have to watch it. It’s not as if there are only two TV channels any longer. Why don’t you encourage them to write insulting jokes about grumpy, balding, middle-aged boors for one of their own screen heroes? I doubt Clarkson – or fellow old grumps like me – will be offended, because we just wouldn’t tune in. And if we did, we’d shrug and say ‘so what’? It’s a free world, with free speech and equality in everything, including bad jokes. Or it was, until people on your hysterical fringes of society got to take over the world. I was going to say I’m not sure who’s more dangerous, the Will Youngs or the ‘serious’ people giving them the time of day, but I have that answer in the Gestapo-like behaviour of Humberside Police. They interrogated one Harry Miller for 30 minutes, because he ‘liked’ a limerick that questioned whether biological men could actually become biological women. The officer said he needed to get inside Mr Miller’s ‘thinking’ – very sinister –and it was being recorded as a hate crime. Now, I suspect Humberside Police solve as few real crimes as Chief Supt Julie Sykes’s Kirklees Keystones, but all of them have become so politicised as to be not just criminally incompetent, but enemies of the people. That today’s police are mistrusted by the public at best and despised at worst, is entirely of their own doing. Cos it isn’t just crime that’ll pay.